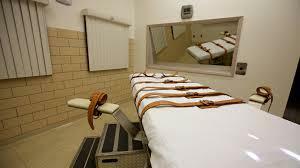 MONTGOMERY, Ala. (AP) — An appellate court said Wednesday that it won't halt the upcoming lethal injection of an Alabama inmate who had asked to be put to death with nitrogen gas. The 11th U.S. Circuit Court of Appeals denied an execution stay for 46-year-old Christopher Lee Price. He is scheduled to be executed by injection Thursday for the 1991 stabbing death of pastor Bill Lynn during a robbery. Prosecutors said Lynn was at his Fayette County home with his wife assembling Christmas presents on Dec. 22, 1991, when the house's power was cut. Lynn was killed with a knife and sword when he went outside to check the fuse box, prosecutors said. A judge sentenced him to death. Alabama has authorized nitrogen as an execution method but has not used it. Price's attorneys argued the state planned to use a drug combination that has been linked to problematic executions while agreeing to execute other inmates by nitrogen hypoxia. The judges agreed with Price's attorneys that nitrogen was an available alternative, but said he had not shown nitrogen hypoxia will significantly reduce the risk of pain.